The Trainer Snippets report shows that Olly Murphy has a particularly good record with his runners that are coming off a break of 60 days plus. From his last 30 such runners, he's managed to have nine winners (30%) and 16 places (53.33%) for level stakes profits of 16.96 and 17.06 respectively. This has also produced an Impact Value of 3.19, meaning he is over three times more likely than average to have the winner. He runs Varene De Vauzelle at Market Rasen in a two miles and seven-furlong handicap hurdle today, and this is his first run for 66 days. Varene De Vauzelle was running consistently well before looking like something was amiss last time out at Stratford, where he finished completely tailed off. Prior to that, he has been placed three times in similar quality handicaps to today, and if he comes back from his break refreshed and back to normal, then I think he has a decent chance of being involved. As well as having a good record with horses after a break, Murphy has a decent looking record here at Market Rasen. Over the past year, he's had three winners (42.86%) and four places (57.14%) from seven runners, for level stakes profits of 16.38 and 19.45 respectively, and an Impact Value of 3.16. He also has a higher strike rate in handicaps when compared to his overall record. The Instant Expert report on the 'Place' setting shows that Varene De Vauzelle is reasonably well suited to today's conditions, with one section of green and two of amber. American Life is the only other runner with any green sections, therefore, it doesn't appear the rest of the field at that well suited. The Pace report shows that although there isn't a string bias, early leaders and prominent runners have the best record here over this distance. Varene De Vauzelle has been ridden predominantly as a hold-up horse, and I wonder if they will try different tactics on him today in a bid to try and break this winless streak. 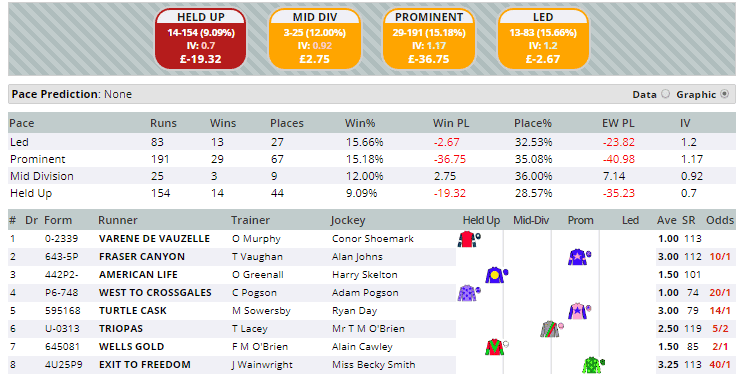 Click here for the 15:00 at Market Rasen.